Found in everything from shampoo to donuts, palm oil is now the most common vegetable oil in the world—and also one of the world's leading deforestation drivers. Palm oil is extracted from the fruit of the oil palm tree, Elaeis guineensis, which thrives in humid climates. The large majority of palm oil production occurs in just two countries, Malaysia and Indonesia, where huge swaths of tropical forests and peatlands (carbon-rich swamps) are being cleared to make way for oil palm plantations, releasing carbon into the atmosphere to drive global warming while shrinking habitats for a multitude of endangered species. The areas being cleared for palm oil are particularly rich in carbon. Indonesian forests store even more carbon per hectare than the Brazilian Amazon thanks to their carbon-rich soil; palm cultivation there was responsible for 2 to 9 percent of worldwide emissions from tropical land use between 2000 and 2010. In Malaysia, the carbon stock of tropical forests can range up to 99 million kilograms of carbon per square mile. That's equivalent to the emissions from driving an average car from New York to San Francisco and back 76 times. While the amount of land used to produce palm oil has grown only moderately in South America and Africa over the past two decades, it has skyrocketed in Southeast Asia, especially Indonesia. One huge source of global warming emissions associated with palm oil is the draining and burning of the carbon-rich swamps known as peatlands. Peatlands can hold up to 18 to 28 times as much carbon as the forests above them; when they are drained and burned, both carbon and methane are released into the atmosphere—and unless the water table is restored, peatlands continue to decay and release global warming emissions for decades. As if that wasn't bad enough, the burning of peatlands releases a dangerous haze into the air, resulting in severe health impacts and significant economic losses. Each year, more than 100,000 deaths in Southeast Asia can be attributed to particulate matter exposure from landscape fires, many of which are peat fires. Beyond its global warming and human health impacts, palm oil production also takes a toll on biodiversity and human rights. Only about 15 percent of native animal species can survive the transition from primary forest to plantation. Among the species vulnerable to palm oil expansion are orangutans, tigers, rhinoceros, and elephants. Furthermore, palm oil growers have also been accused of using forced labor, seizing land from local populations, and other human rights abuses. The impacts of palm oil production have begun to draw a response from both governments and the private sector in recent years. There has been significant movement from Southeast Asian governments to address palm oil impacts, though there is still much to be done. In 2010, Indonesia established a moratorium on new concessions for oil palm, timber and logging operations on primary forests and peatlands. In addition, Indonesia has responded to worsening haze conditions by calling for a halt to clearance and drainage of peatlands, and for the restoration of those already drained. Malaysia has also begun to act to protect some of its forests, though its protections thus far have not been as strong as Indonesia's. On the private-sector side, the Roundtable on Sustainable Palm Oil (RSPO) was formed to bring oil producers, non-governmental organizations (NGOs) and other stakeholders together to improve the sustainability of palm oil production. However, current RSPO standards fall short in important respects. For instance, while primary forests are protected under RSPO regulations, secondary, disturbed, or regenerating forests are left unprotected. Peatlands are also given limited protection under RSPO guidelines. So "RSPO-certified" does not necessarily mean "deforestation-free." One promising avenue for reducing palm oil's deforestation impact is by influencing the companies that buy palm oil from global traders to use in their consumer products. Vegetable oils are one of the most traded global commodities, and this is particularly true of palm oil. 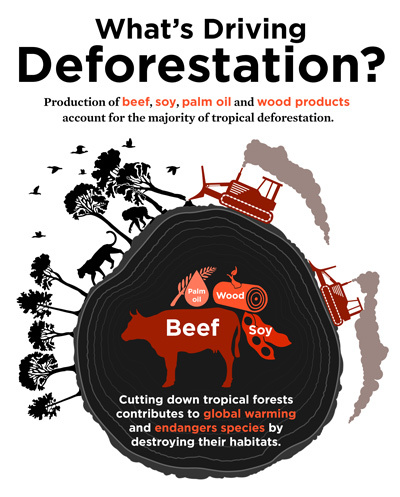 Unfortunately, as recently as 2013, much of the palm oil entering the global market was not deforestation-free. However, in response to intense pressure from UCS, our supporters, our ally organizations, and the public, a growing number of American consumer companies have adopted commitments to purchase exclusively deforestation-free and peat-free palm oil. As of 2016, more than 60 percent of palm oil traded globally was covered by such commitments—a huge change from just three years before. As more companies make deforestation-free commitments, they will influence decisions made further up the supply chain by traders and producers. Palm oil production will continue to expand. The U.S. Food and Drug Administration recently banned trans fats from American products, and palm oil—one of the few vegetable oils that is solid at room temperature like trans fats—is a likely replacement. Although expansion has recently slowed, growth is expected to continue in a select group of countries over the next decade, including Malaysia and Indonesia. And other countries, including Brazil, the Democratic Republic of the Congo, Peru, and Colombia, have forested area suitable for palm oil cultivation. It will be crucial to ensure that this expansion does not continue to come at the expense of forests. 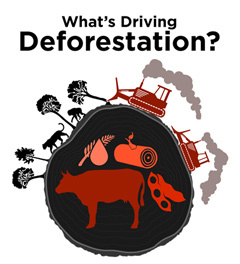 Hungry for more information about palm oil and deforestation? Check out UCS’ Palm Oil Scorecard.